I�ve got spikes on my GPS map � how do I remove them? Imperfections in GPS data may cause spikes to appear on track maps. These may be soothed out and removed. 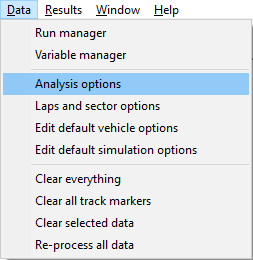 To do this, enter the "Data" menu and select "Analysis Options". This will open up a window. Tick the box marked "Check GPS data for speed /positional consistency" and un-tick the box which prevents the data from the accelerometers form being used. Now press "Ok". The spikes should now have been removed from the track map.